Not all of the Glassboro Fire Departments traditions have to do with apparatus and fire gear. Here, Thomas Stewart and George Beach show off Beach’s dog Mickey at the 1965 Memorial Day Parade! And Todd Armstrong, John Hurff, Mike Reed, and Mark Reed wait in line to see Santa (Chris Siebert) at the 1968 Christmas Party. This tradition continues today with a Christmas party for all of the Borough children every year! 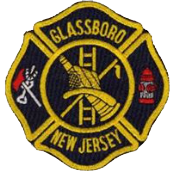 The past 100 years have brought about many changes for the Glassboro Fire Department. But one thing that has remained constant is the need for the company. See below to read about some of the historical fires of our Borough!